Shadow Lives — Writings on Widowhood. THE book under review is an important treatise on the heart-rending plight of widows in the patrilineal Hindu society. The critique delineates the oppressive structures that give rise to oppressive traditions. The book is arranged in three parts: Hindu scriptures dealing with prescriptions, injunctions and laws concerning widows and 19th and 20th century documents dealing with widows; personal narratives of widows; and finally creative writings of Indian writers on the subject of widowhood. Kautilya’s Arthashastra and other Hindu dharamashastras especially the Manusmriti, prescribe harsh injunctions for widows. A widow is denied the use of honey, meat, salt, pungent condiments, ornaments, perfumes, flowers, dyed clothes and all other things of life normally cherished by women. She is to eat only once a day, sleep on the floor and observe celibacy and numerous fasts. She is tonsured by a barber at regular intervals. Among numerous documents dealing with widows in 19th and 20th century, a few deserve special notice. Ishwar Chandra Vidyasagar, a crusader for widows’, cause in 19-century Bengal, makes a forceful plea for widow remarriage and argues that shastras sanction it. He said it was an unmitigated evil as it led to prostitution, adultery, and foeticide. Tarabai Shinde’s essay is a remarkable piece of polemical writing defending widows. Such was the wrath it incurred in our male-dominated society that she never wrote anything else thereafter. Pandita Ramabai’s piece makes a scathing attack on the double standards of a society that prescribes different moral codes for men and women. Jyotiba Phule blames the "Aryan institution" for the misery heaped on widows. Dayanand Saraswati advocates niyoga (levirate union). The views of Mahatma Gandhi on the issue can be described as either interesting or disturbing, depending on the way one looks at them. He finds widowhood a symbol of renunciation and regards "widow’s life as an ornament to Hinduism" as patient suffering is impossible to rival", and thus "God created nothing finer than the Hindu widow". However, he is against child marriage and recommends remarriage for a child widow. He pleads that man too, like woman, should not remarry and thus "widows would not feel life to be a burden". The section is rounded off with extracts from a report of a study sponsored by the National Commission for Women in 1996 on the condition of the widows in Vrindavan. The graphic description of the pathetic condition of more than 5000 widows in and around Vrindavan makes the views of Mahatma Gandhi look more sentimental than rational. Most of these widows have just one piece of clothing to cover themselves, beg outside the temples and get Rs 2 per day, a fistful of rice and a pinch of salt for singing bhajans in three shifts in bhajan ashrams. Part IIof the book deals with personal narratives of a number of widows, including those who lost their husbands during Partition, the Telangana Movement and the 1984 anti-Sikh riots. It includes a piece dealing with the remarkable courage shown by Anandibai Karve in facing early widowhood and her subsequent marriage with the well-known 19th-century Maharastrian social reformer D.K. Karve that created a furore. Karve established the Widow Marriage Association to break public resistance to such marriages and believed that education alone would help a Hindu widow withstand social prejudice. 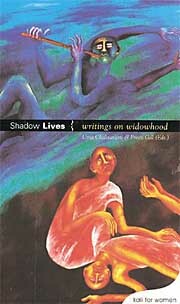 The section includes the harrowing account of several widow inmates of Vrindavan hailing from different parts of India. The travails of Durga Bhabi, wife of Bhagwati Charan Vohra, an associate of Bhagat Singh, speak of her unbounded courage in the face of adversities. When her husband died in a bomb blast, she met Mahatma Gandhi to seek his intervention with the British Government in getting Bhagat Singh’s and his comrades’ death sentences commuted. The meeting was a disaster: She served jail term, moved to Delhi in 1937 and became the DCC President. Then she moved to Ghaziabad to live with her son and died in February 2000, "looking on at the collapse of India she struggled to create". Similar is the account of Jaggi Devi, a widow, who married Baba Ram Chander, a legendary figure in the Peasant Movement in Avadh. She participated in the movement and died in dire poverty after India became independent. Another story is that of Dudala Salamma who participated in the Telangana Movement. Then follow the agonising stories of three Sikh women whose husbands were brutally murdered in the 1984 anti-Sikh riots and of a Christian teacher living in Srinagar whose husband, a Kashmiri Brahmin, was gunned down by terrorists. The final section dealing with creative writings has as many as 22 pieces by known Indian writers in different Indian languages. It is virtually a galaxy of India’s creative luminaries ranging from Rabindranath Tagore and Munshi Prem Chand to Sunil Gangophadhyaya and Mahasweta Devi. Writings of Mahadevi Varma, Jainedra Kumar, M.K. Indira, Rajinder Singh Bedi, Indira Goswami, Razia Sajjad Zaheer, Mrinal Pandey and others also feature in this section. Literature, it is said, mirrors life. However, this section mirrors the misery of widows more poignantly and powerfully than the actual narratives. Besides Rajinder Singh Bedi’s piece from his classic Ek Chadar Maili Si, a masterly treatment of levirate marriage, and Mahadevi Verma’s extract from her memoirs stressing the need for women to take pride in their own identities, this reviewer finds Bibhutibhushan Bandopadhyay’s Dramomoyee Goes to Kashi and Mahasweta Devi’s Rudali exceptionally powerful pieces of writing on Indian widowhood. The old widow in Bibhutibushan’s story is taken to Kashi by her grandson to die there so as to ensure her passage to heaven. She lives in the neighbourhood of another pious widow whose preoccupation with ensuring a better birth in the next life is beyond the comprehension of this simple peasant woman. It creates situations hilarious as well as pathetic and she finds peace only when she returns to her village, back in the company of her cow, Mungli, and fruit trees in her humble orchard. Mahasweta Devi’s Rudali is a moving portrait of two widows who join hands to act as professional mourners for lecherous zamindars after their death. It is a powerful critique of a socio-economic system which renders widows vulnerable to exploitation at the hands of zamindars, moneylenders, priests and their touts. A lot has been written on the plight of Indian widows, especially of the higher castes. The book under review is one of the best on the subject and is a must-read for those who want to know what the real life of a Hindu widow is like.